You will be greeted by the following "About software" page. Read it and then click "Next"
Here is some information about our commercial products and licensing. Please read though the agreement, type in your name or company and click "Next". This page will look over your basic configuration settings, these include the server type, domains you wish to use, and gives you a chance to specify an administrator for the domain. Also, you will be selecting what type of database Tigase server will be using (configuration comes later). If you do not specify an administrator and password, one is made for you, which will be admin@yourdomain and password is tigase. If you wish to configure your server beyond the basics, check Advanced configuration options. 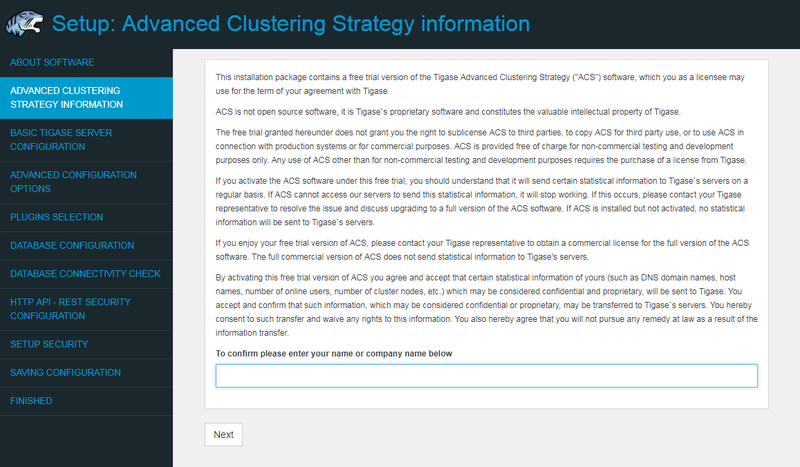 The Advanced configuration page. Select what components and configurations you need. Some may be highlighted red to indicate conflicts or unmet requirements. Plugins which will be loaded by the server, most plugins are enabled by default. Some may be highlighted red to indicate conflicts or unmet requirements. 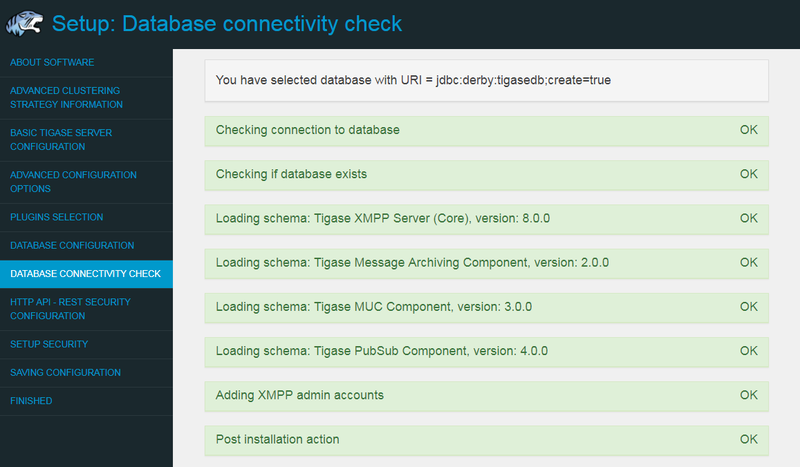 You should see a page like this after a successful database setup. This page will reveal any issues with your database setup such as invalid URIs, passwords, and schemas. You may hit Back on your browser to check credentials and settings and try again. Next a page asking if you’d like to provide an API Access Key to access HTTP REST commands. It is highly recommended that you either specify an API key or block access. Open API keys allow any REST command to be interpreted by the server. The Setup Access Page will be locked from the admin/tigase user as specified above. This is your chance to have the setup pages add a specific user in addition to admin accounts to re-access this setup process later. If left blank, only JIDs listed in admin will be allowed to access. The installation is complete and this is what the config.tdsl file will look like. If you have a custom setup, or would like to put your own settings in, you may copy and past the contents here to edit the current config.tdsl file. Click "Save" to write the file to disk. You have now finished the installation, proceed to the next step to restart the server.